How can VC teachers foster and support e-learning and virtual learning? 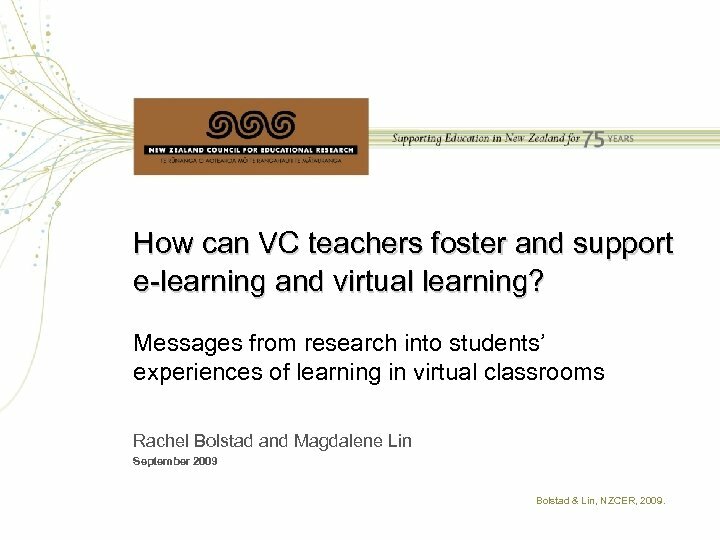 Messages from research into students’ experiences of learning in virtual classrooms Rachel Bolstad and Magdalene Lin September 2009 Bolstad & Lin, NZCER, 2009. Why students’ experiences of learning in virtual classrooms? • Virtual classrooms have the potential to be quite different from conventional classrooms. • What are the implications of these differences for students? – Are virtual classes more, less or equally engaging for students? – Are they better, worse, or just as good for supporting learning? – Are they just a different way of doing the same things, or do they offer affordances that could better support 21 st century learning? • How does (or could) teaching and learning in virtual classrooms support the intentions of The New Zealand Curriculum (Ministry of Education, 2007)? • How can VC teachers foster and support e-learning and virtual learning? Bolstad & Lin, NZCER, 2009. Research Overview • MOE contracted NZCER to undertake research on students’ experiences of learning in virtual classrooms. • Research commenced Sept 2008. • Mixed method data collection, including: – Focus group interviews with 55 students in 27 schools. – An online survey completed by 250 students from 54 schools. – Feedback workshops with VC teachers and e. Principals to discuss findings. • Data were analysed after each data collection phase to identify patterns and themes. • Final report completed Sept 2009. Bolstad & Lin, NZCER, 2009. What happens when teaching and learning moves form the conventional to the virtual classroom? The conventional classroom The virtual classroom How should VC teachers operate in this new environment to better support their students’ learning? Bolstad & Lin, NZCER, 2009. What a virtual classroom looks like (possibilities distilled from the research findings) I love this! I’m totally in control of my learning! WOOHOO! If I need help, who am I supposed to ask? I’ll just wait for my teacher to tell me what to do. Do I just teach the way I would normally teach, except through video-conferencing? What do other VC teachers do? What will work best for my students? Is one VC session per week enough? Do I need to use lots of other ICT to support my students? How do I build a learning community amongst students at different locations? This is weird. I don’t know those other students. I’ll just stay quiet. What if they can’t handle learning more independently? This sux. I’m lost. I’m not going to class. Will someone at their home school keep an eye on them and help them during the rest of the week? Bolstad & Lin, NZCER, 2009. 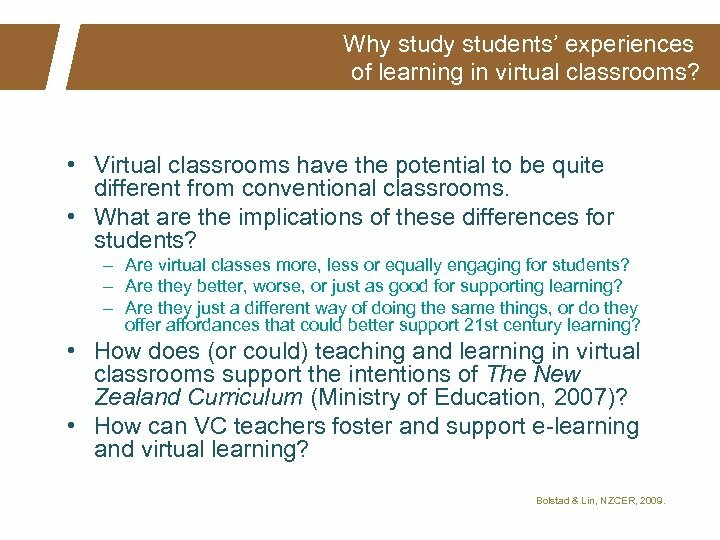 What did NZCER’s research tell us about students’ experiences of learning in virtual classrooms? 4 overlapping “key themes” emerged What is the right balance between support and independence? What do students need? 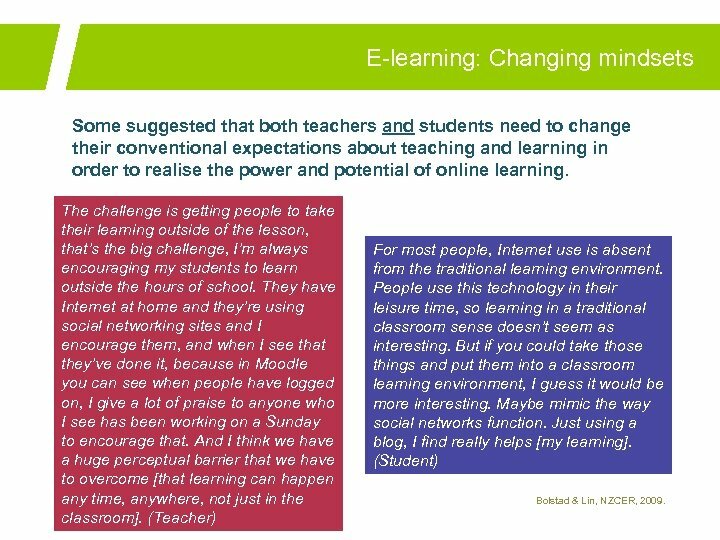 Are VC teachers and students realising the potential of Elearning as described in NZC? (Ministry of Education, 2007) Independence and support E-learning Shared learning Personalising learning Are VC classes environments where learning is shared and collaborative? Are VC classes supporting students’ learning needs? Are teachers and schools set up to support personalisation of learning? Bolstad & Lin, NZCER, 2009. Independence and Support: What is the right balance? The research suggests: • Both students and teachers tend to see VC as requiring greater learning independence than most conventional classes. • However, some students manage better than others. • I love this! I’m totally in control of my learning! WOOHOO! There are differing views about what can be done to support students who are not coping, and whose responsibility this is. This sux. I’m lost. I’m not going to class. Bolstad & Lin, NZCER, 2009. Whose responsibility is it to ensure students can manage in a more independent learning environment? Perspective 1: VC only works for certain types of students (e. g. those who are mature, independent, good at self-managing their own learning) Barbour and Reeves (2009) suggest that this “ideal” virtual student, namely, “highly motivated, self-directed, self disciplined independent learner[s] who could read and write well, and who also had a strong interest in or ability with technology” (p. 410) has been modelled on theories of distance education, and is more consistent with the characteristics “more often attributed to adult learners, who according to Knowles (1970) are more self-directed and independent in their orientation to learning than adolescents” (p. 410), and “probably represents a small percentage of high school students in general… in other words, it is not the description of the typical student” (p. 407). Bolstad & Lin, NZCER, 2009. Whose responsibility is it to ensure students can manage in a more independent learning environment? Perspective 2: Virtual classes can be adapted to work for all/most students (we just need to rethink our teaching practices to support different students’ needs) “We expect them to be like university students, but the more you question that [assumption], the more successful they become. ” (Teacher) A teacher who had been teaching a class of Year 9 and 10 students via VC felt that younger students could successfully learn in this medium if the teaching and curriculum was structured in a way that adequately supported them. Part of his strategy for supporting these students was to develop curriculum content that was personalised and localised to the area where his students lived. This teacher also had fairly regular face-to-face contact with the students when they came to his school for practical lessons, and was experimenting with different pedagogical strategies to keep them active and engaged during their VC lessons. Bolstad & Lin, NZCER, 2009. Supporting VC students: What should teachers know? 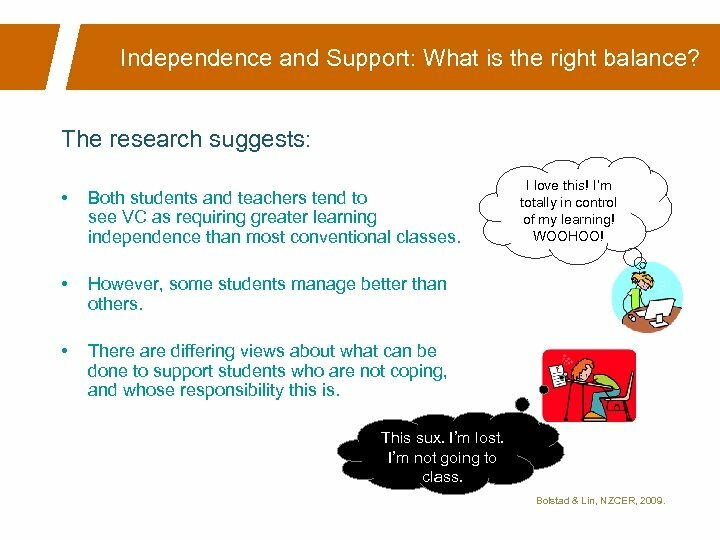 VC teachers should be aware that: • Not all students will start with the same level of “readiness” to cope with the more independent learning environment – but this doesn’t mean that virtual learning can’t work for all students, given the appropriate support. • In the absence of clear and proactive support structures, some students may conclude that it’s their own responsibility to manage their own learning independence. - If students are already good at self-managing, this is great! They may enjoy the opportunity to have more control of their learning. - If they aren’t so experienced or confident in self-managing or working independently without a teacher chivvying them along, they won’t necessarily seek out help when they are having problems. Teachers need to be proactive in working with their students to find out what support and conditions they need in order to succeed as virtual learners. Bolstad & Lin, NZCER, 2009. Supporting VC students: What can teachers do? Here are some practices that teachers have adopted in their own VC classes: • Directing questions at individual students to see how they’re getting on and to ensure that quiet students contribute to the discussion. • Asking students to sign out one at a time, so that they can find out how they’re getting on and check if they have any last questions or problems they need help with. • Establishing regular email communication with students, responding promptly to their emails, and following up with any who they stop hearing from to find out if everything is okay. • Providing different ways for students to work on their learning (for example, some teachers notice that “quiet” students are actively using Moodle and Knowledge. Net to support their learning throughout the week). • Setting out class plans, and expectations at the start of the term and week, so that students know what they will be doing, and when it needs to be done by. Also, renegotiating those expectations with them depending on how they are progressing, to ensure the expectations are realistic and achievable. Bolstad & Lin, NZCER, 2009. Shared learning: Getting students talking The “effective pedagogy” section of the Curriculum states that students learn best when their teachers “create a supportive learning environment” and “facilitate shared learning” (Ministry of Education, 2007, p. 34). “Teachers encourage this process by cultivating the class as a learning community. In such a community, everyone, including the teacher, is a learner; learning conversations and learning partnerships are encouraged; and challenge, support, and feedback are always available. As they engage in reflective discourse with others, students build the language that they need to take their learning further. ” Bolstad & Lin, NZCER, 2009. Shared learning in virtual classrooms • The research suggests that communication and collaboration between students is an aspect that is lacking in some VC classes, especially between students from different locations, and outside weekly videoconferencing session. • Lone students (those who are the only ones from their school in the VC class) had less interaction with their peers, and while some did not mind this, for others, it was an issue and it had an impact on their achievement. • Some students explained that they reservations about discussing their learning with their peers because they did not feel as though they knew each other well enough. • Some teachers felt time constraints made it hard to give students more opportunities to engage in discussions or lead their own learning. With only one VC session per week, teachers wanted to ensure they got through the content and students had the opportunity to get what they needed from their teacher. Bolstad & Lin, NZCER, 2009. 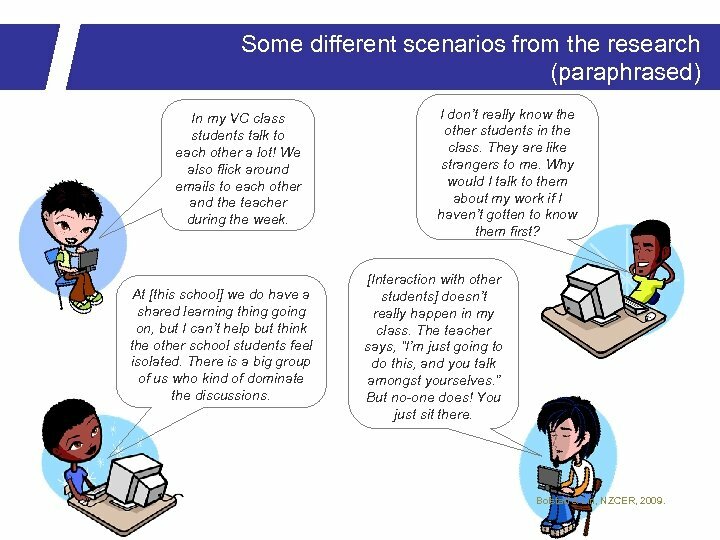 Some different scenarios from the research (paraphrased) In my VC class students talk to each other a lot! We also flick around emails to each other and the teacher during the week. At [this school] we do have a shared learning thing going on, but I can’t help but think the other school students feel isolated. There is a big group of us who kind of dominate the discussions. I don’t really know the other students in the class. They are like strangers to me. Why would I talk to them about my work if I haven’t gotten to know them first? [Interaction with other students] doesn’t really happen in my class. The teacher says, “I’m just going to do this, and you talk amongst yourselves. ” But no-one does! You just sit there. Bolstad & Lin, NZCER, 2009. 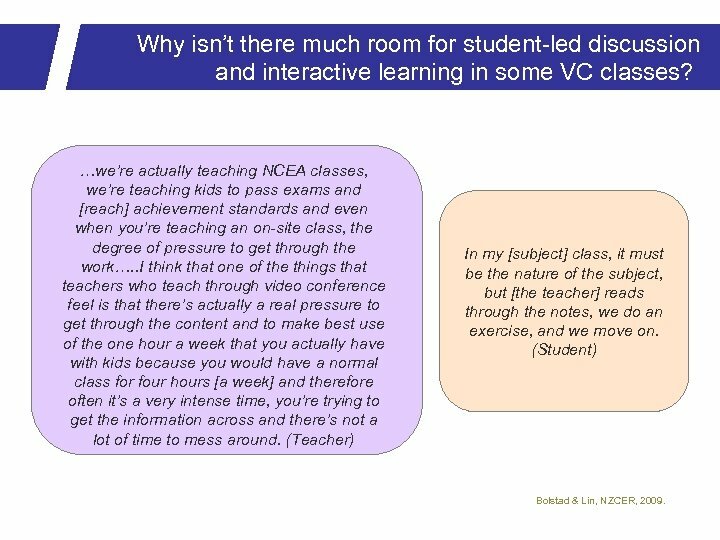 Why isn’t there much room for student-led discussion and interactive learning in some VC classes? …we’re actually teaching NCEA classes, we’re teaching kids to pass exams and [reach] achievement standards and even when you’re teaching an on-site class, the degree of pressure to get through the work…. . I think that one of the things that teachers who teach through video conference feel is that there’s actually a real pressure to get through the content and to make best use of the one hour a week that you actually have with kids because you would have a normal class for four hours [a week] and therefore often it’s a very intense time, you’re trying to get the information across and there’s not a lot of time to mess around. (Teacher) In my [subject] class, it must be the nature of the subject, but [the teacher] reads through the notes, we do an exercise, and we move on. (Student) Bolstad & Lin, NZCER, 2009. Shared learning: What can teachers do? Here are some practices that teachers have adopted in their own VC classes: Helping students get to know each other • • Organise cluster e-days to help VC students and teachers get together in person to “break the ice”. Ask students to introduce themselves to their classmates (e. g. who they are, their goals for the year, a favourite motto or saying, things they are interested in) during the first VC class or on the class forum. Providing opportunities for students to lead their learning interactions with each other • Allow students to facilitate parts of their VC lesson, encourage group discussions among students, have students develop questions for one another, get students to give each other feedback on their work, etc. ICT can help to facilitate collaborative learning between students, but the technology itself does not ensure that shared learning occurs. Bolstad & Lin, NZCER, 2009. E-learning: New ways of learning? 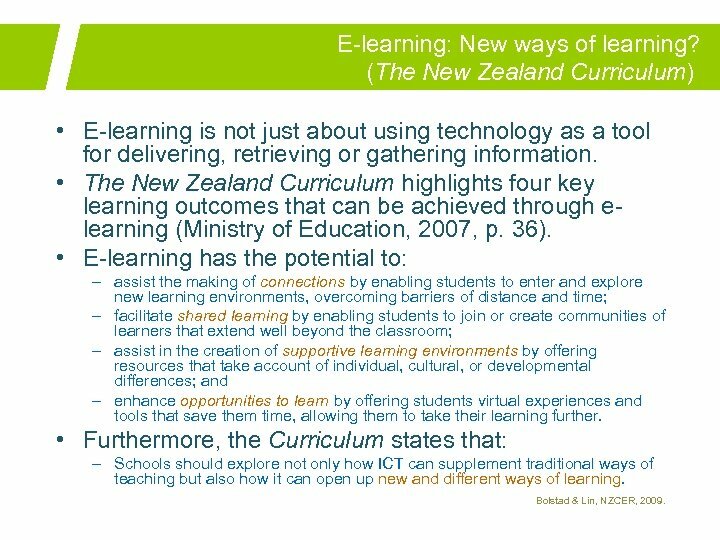 (The New Zealand Curriculum) • E-learning is not just about using technology as a tool for delivering, retrieving or gathering information. • The New Zealand Curriculum highlights four key learning outcomes that can be achieved through elearning (Ministry of Education, 2007, p. 36). • E-learning has the potential to: – assist the making of connections by enabling students to enter and explore new learning environments, overcoming barriers of distance and time; – facilitate shared learning by enabling students to join or create communities of learners that extend well beyond the classroom; – assist in the creation of supportive learning environments by offering resources that take account of individual, cultural, or developmental differences; and – enhance opportunities to learn by offering students virtual experiences and tools that save them time, allowing them to take their learning further. • Furthermore, the Curriculum states that: – Schools should explore not only how ICT can supplement traditional ways of teaching but also how it can open up new and different ways of learning. Bolstad & Lin, NZCER, 2009. E-learning: New ways of learning? (The virtual classroom) • • • The research suggests that while VC classes may utilise ICT for information-orientated purposes, the more innovative applications of elearning as stated in The New Zealand Curriculum appear to be the exception rather the norm across many classes. A few teachers and students have begun to see some of these possibilities in their VC classes (e. g. anywhere/anytime learning, facilitating the creation of new learning communities). However, many classes appeared to be using ICT in ways that reinscribe traditional teaching and learning approaches (e. g. delivery of curriculum content, with little active student engagement), rather than exploring new and different ways of learning. Some VC classes do not make use of any online resources for practical reasons (e. g. lack of computers and broadband Internet access). However, even with Internet access some students did not see the need to use web-based learning tools and support, and some teachers had found it difficult to engage their students in using e-learning even when these facilities were at their disposal. Bolstad & Lin, NZCER, 2009. 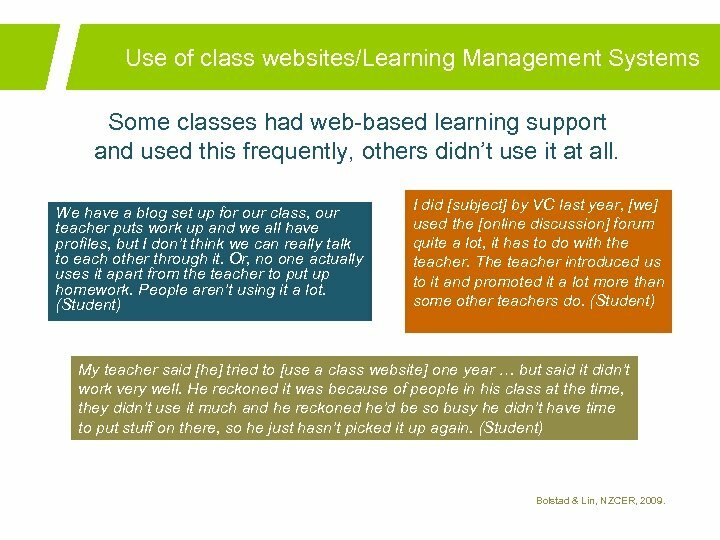 Use of class websites/Learning Management Systems Some classes had web-based learning support and used this frequently, others didn’t use it at all. We have a blog set up for our class, our teacher puts work up and we all have profiles, but I don’t think we can really talk to each other through it. Or, no one actually uses it apart from the teacher to put up homework. People aren’t using it a lot. (Student) I did [subject] by VC last year, [we] used the [online discussion] forum quite a lot, it has to do with the teacher. The teacher introduced us to it and promoted it a lot more than some other teachers do. (Student) My teacher said [he] tried to [use a class website] one year … but said it didn’t work very well. He reckoned it was because of people in his class at the time, they didn’t use it much and he reckoned he’d be so busy he didn’t have time to put stuff on there, so he just hasn’t picked it up again. (Student) Bolstad & Lin, NZCER, 2009. E-learning: Seeing the possibilities • One teacher described how a class website was used to develop students’ habits of giving each other feedback and reflecting on the feedback they receive. It was incredible how often the students were posting at 10 o’clock at night and actually for some of them, particularly the more high achieving in that class, how many times they came back and reviewed comments both by the teacher and also that they had made, so they were really reflecting on their own learning which is not so much assisting with that community building [potential of the learning management system], but it was a really strong indicator of that tool allowing them to develop that reflective process. And they were able to comment on and read each other’s blog posts as well. And we were running it very much as their electronic diary of learning. (Teacher) • Another teacher noticed the opportunities that online learning had offered to some of his quieter face-to-face students. I’ve noticed in my face-to-face class that some of the girls who I call the quiet girls, very humble learners, they feel that they’re not very bright but they work very hard and they’re the ones who are using the Moodle site on a Sunday whereas the ones who think they know it all, they don’t go anywhere near it and they’re not interested. (Teacher) Bolstad & Lin, NZCER, 2009. E-learning: Changing mindsets Some suggested that both teachers and students need to change their conventional expectations about teaching and learning in order to realise the power and potential of online learning. The challenge is getting people to take their learning outside of the lesson, that’s the big challenge, I’m always encouraging my students to learn outside the hours of school. They have Internet at home and they’re using social networking sites and I encourage them, and when I see that they’ve done it, because in Moodle you can see when people have logged on, I give a lot of praise to anyone who I see has been working on a Sunday to encourage that. And I think we have a huge perceptual barrier that we have to overcome [that learning can happen any time, anywhere, not just in the classroom]. (Teacher) For most people, Internet use is absent from the traditional learning environment. People use this technology in their leisure time, so learning in a traditional classroom sense doesn’t seem as interesting. But if you could take those things and put them into a classroom learning environment, I guess it would be more interesting. Maybe mimic the way social networks function. Just using a blog, I find really helps [my learning]. (Student) Bolstad & Lin, NZCER, 2009. Fostering E-learning: What can teachers do? Here are some practices that teachers have adopted in their own VC classes: • Finding out if students have sufficient access to, and interest in using, online learning tools and/or learning management systems to support their learning. • Getting students into the habit of using their websites and online management systems by ensuring that they use them from day one. • Modelling themselves as an online learner/participant in the online learning environment. • Noticing when students are choosing to continue their learning online and/or are actively contributing to online discussions, and providing positive feedback to encourage them. • Seeking feedback from students about what’s working well, what other kinds of features they would like to have in their online learning environment, and, if they are not using the online learning environment, why not. Bolstad & Lin, NZCER, 2009. 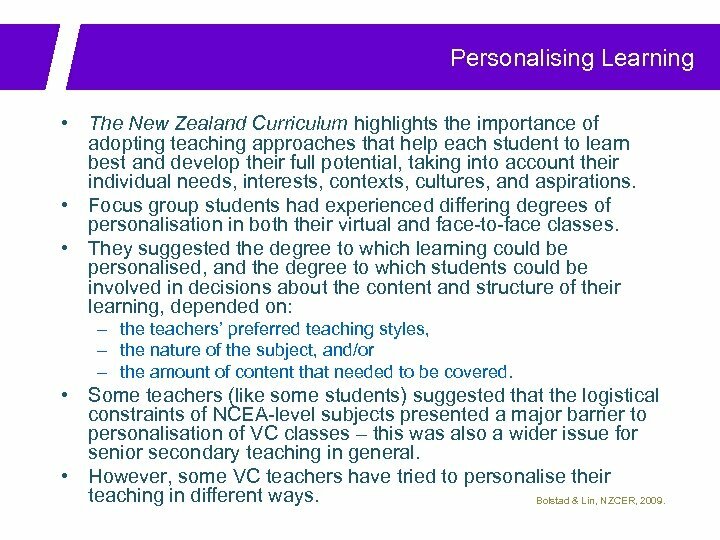 Personalising Learning • The New Zealand Curriculum highlights the importance of adopting teaching approaches that help each student to learn best and develop their full potential, taking into account their individual needs, interests, contexts, cultures, and aspirations. • Focus group students had experienced differing degrees of personalisation in both their virtual and face-to-face classes. • They suggested the degree to which learning could be personalised, and the degree to which students could be involved in decisions about the content and structure of their learning, depended on: – the teachers’ preferred teaching styles, – the nature of the subject, and/or – the amount of content that needed to be covered. • Some teachers (like some students) suggested that the logistical constraints of NCEA-level subjects presented a major barrier to personalisation of VC classes – this was also a wider issue for senior secondary teaching in general. • However, some VC teachers have tried to personalise their teaching in different ways. Bolstad & Lin, NZCER, 2009. Personalising Learning in virtual classrooms Since different students progressed through their learning at different speeds, some teachers felt it was important not to adopt a transmissive teaching approach during their VC sessions because this might leave some students lost or behind, or bored and feeling “held back” if they have to sit through content they had already learned. When I’m actually video conferencing, I don’t go through the work that they have in front of them unless they want to go through that, I have question and answers at the start and at the finish, and looking forward to what we’re going to do next, but I try and deliver something that’s different from what they experience every day that they haven’t got me there. I use my lessons as tutorial sessions, they do the work during the week, I go over what they don’t understand, things that might be ultra important, I give them visuals (like pictures/DVDs/Power. Points). My main aim is to facilitate conversation, get them to engage with the material, but [with] limited success at times. Bolstad & Lin, NZCER, 2009. 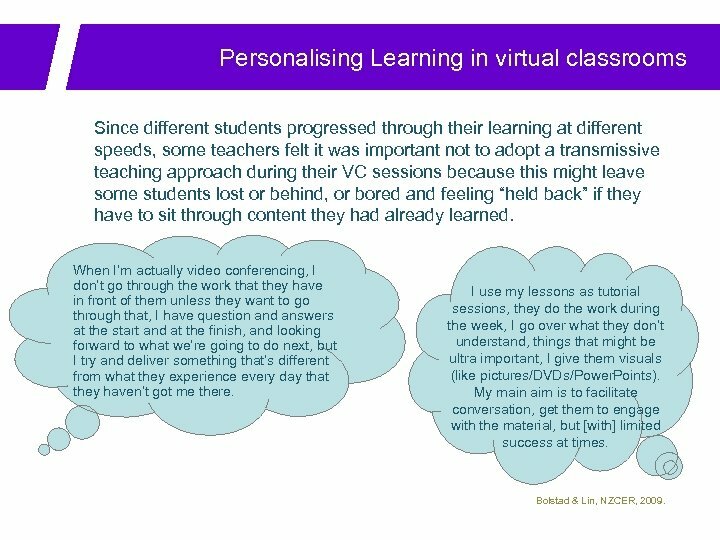 Personalising Learning in virtual classrooms Seeking and responding to student feedback • Some students said their VC teachers offered them choices of topic or activity, and let them decide which option they were more comfortable with or interested in. Others said their teachers had asked for and responded to student feedback. – We gave the VC [subject] teacher feedback and now he puts stuff into games, crosswords, space invaders on the [ecluster] website. He does a lot of work online as well, doing activities like space invaders. (Student) Connecting content to students’ interests and experiences • One teacher described personalising the content of his subject to be more relevant and connected to the unique natural environment and culture of the region his students lived in. Another teacher allowed each student to choose an assignment in an area that interested them, and supported the students to learn in relation to their chosen area. The teacher said this created more work from a teaching point of view “because I can’t teach them all the same thing at the same time”, but ultimately believed this was a more worthwhile approach to support better student learning. Bolstad & Lin, NZCER, 2009. 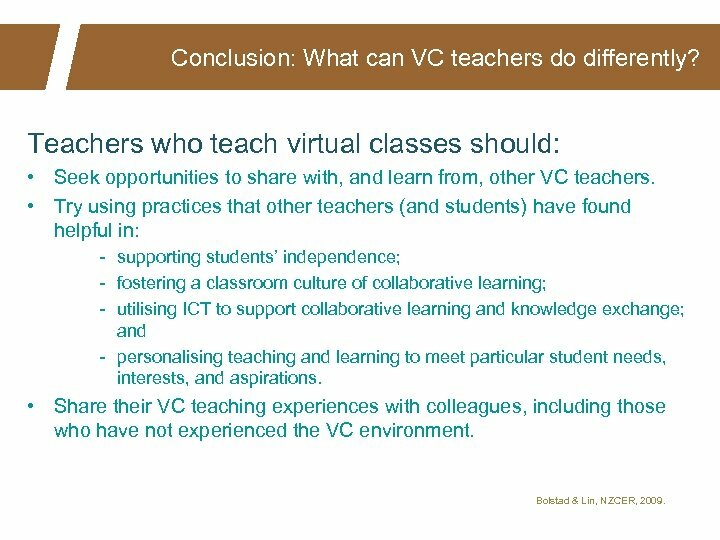 Personalising Learning in virtual classrooms Adapting the structure of VC classes • One VC student taking a language subject had been learning significantly faster than other students in her VC class, and found there was little conversational interaction between students. The student, her e. Principal, and VC teacher negotiated for the student to withdraw from that class and instead, have individual lessons with her VC teacher so she would have more support to progress to her full potential in the language she was learning. • One VC teacher described dividing her VC class into two subgroupings, one which was moving at a faster pace than the other. Dividing the students in this way allowed her to match her teaching to best suit the needs of each group. • Another teacher found that individual students within her class had different preferred methods for seeking additional personalised support. For example, one student liked to stay on in the VC session after the other students had logged out to continue talking with the teacher. Another student preferred to keep in touch by email, and a third preferred to communicate with the teacher via text messages. Bolstad & Lin, NZCER, 2009. 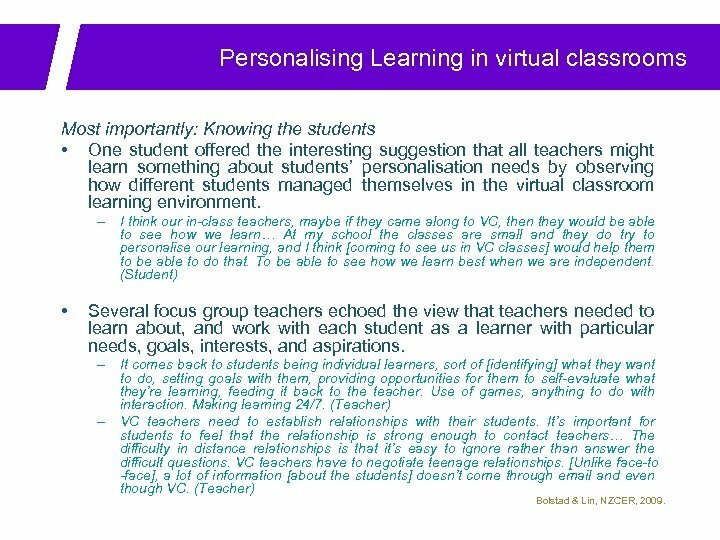 Personalising Learning in virtual classrooms Most importantly: Knowing the students • One student offered the interesting suggestion that all teachers might learn something about students’ personalisation needs by observing how different students managed themselves in the virtual classroom learning environment. – I think our in-class teachers, maybe if they came along to VC, then they would be able to see how we learn… At my school the classes are small and they do try to personalise our learning, and I think [coming to see us in VC classes] would help them to be able to do that. To be able to see how we learn best when we are independent. (Student) • Several focus group teachers echoed the view that teachers needed to learn about, and work with each student as a learner with particular needs, goals, interests, and aspirations. – It comes back to students being individual learners, sort of [identifying] what they want to do, setting goals with them, providing opportunities for them to self-evaluate what they’re learning, feeding it back to the teacher. Use of games, anything to do with interaction. Making learning 24/7. (Teacher) – VC teachers need to establish relationships with their students. It’s important for students to feel that the relationship is strong enough to contact teachers… The difficulty in distance relationships is that it’s easy to ignore rather than answer the difficult questions. VC teachers have to negotiate teenage relationships. [Unlike face-to -face], a lot of information [about the students] doesn’t come through email and even though VC. (Teacher) Bolstad & Lin, NZCER, 2009. Conclusion: What can VC teachers do differently? This virtual classrooms research suggests that it would be a mistake to think that simply having the technology available in schools means that teachers and students will naturally gravitate towards 21 st century teaching and learning approaches. As this research shows, some students who can imagine innovative forms of elearning may find themselves amongst peers and teachers and who don’t see these as necessary or relevant. Similarly, some teachers who pour effort into cultivating a digital learning space for their students may be met with tepid enthusiasm or digital silences from students who choose not to engage, for reasons the teacher may or may not understand. Schools ought to be using ICT to help develop new kinds of curriculum and pedagogy that will both respond to and shape the 21 st-century world. ICT is interesting for its capacity to support radical pedagogical change, but it is not the sole instrument of this change, nor the reason for it. These kinds of pedagogies would emphasise, for example, student learning as collaborative knowledge building (for example, involving collaboration between students, and between students and other people who may be outside the school); a focus on students learning through active engagement with authentic contexts; and supporting students to find real audiences for the products of their learning. Bolstad & Lin, NZCER, 2009. Conclusion: What can VC teachers do differently? Reshaping school education along these lines obviously requires a deep consideration of what kinds of learning tools we might need, and what kinds of social, cultural, and literacy practices emerging in the Web 2. 0 environment could be used in schools for learning purposes. Much has been written about mismatch between 21 st century education ideas and the fundamental structures on which our current school system is built (Kress, 2003; Bolstad et al. , 2005; Bolstad and Gilbert, 2008), and these clearly provide a significant challenge. However, within the current education system there are educators whose interest and willingness to explore their own teaching approaches – and try doing things differently – could provide levers for wider shifts. Gibbons (2008) uses the metaphor of the “electric teacher” to describe an educator who is critical, reflective, and empowered by their knowledge both of the technologies they may use in their teaching, and (most importantly) their own capacities and capabilities as an educator. Think of the electricity one feels in the presence of a passionate and reflective teacher – that’s the electric teacher (Gibbons, 2008, p. 16). 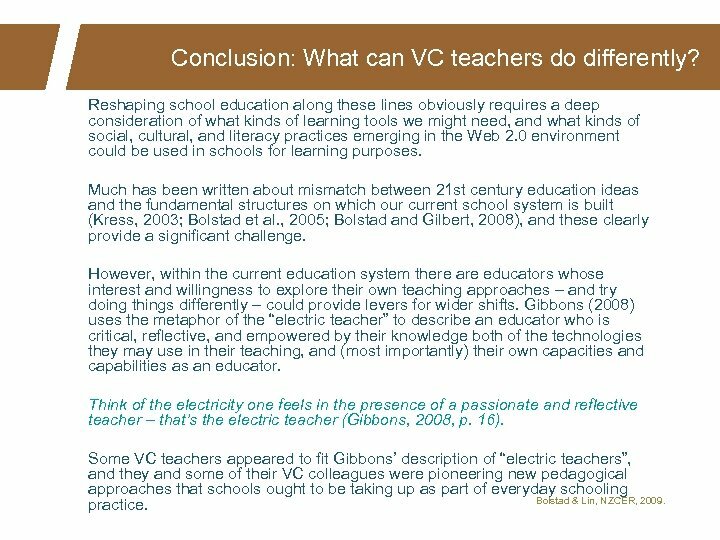 Some VC teachers appeared to fit Gibbons’ description of “electric teachers”, and they and some of their VC colleagues were pioneering new pedagogical approaches that schools ought to be taking up as part of everyday schooling Bolstad & Lin, NZCER, 2009. practice. Conclusion: What can VC teachers do differently? Teachers who teach virtual classes should: • Seek opportunities to share with, and learn from, other VC teachers. • Try using practices that other teachers (and students) have found helpful in: - supporting students’ independence; - fostering a classroom culture of collaborative learning; - utilising ICT to support collaborative learning and knowledge exchange; and - personalising teaching and learning to meet particular student needs, interests, and aspirations. • Share their VC teaching experiences with colleagues, including those who have not experienced the VC environment. Bolstad & Lin, NZCER, 2009.